December 2011 – CREATE. PLAY. TRANSFORM. Happy New Year! Clay Ave Pottery Studio is looking forward to a greater year! To old and new students in 2011, Thank You! My life as a Potter in Manila will not be possible, if not for your dedication, in learning a new craft. Your presence at the pottery studio means a lot to me. Stories, laughter, and lessons were shared and learned. I hope to see you all again in 2012! Time has flown too quickly in 2011. The days, weeks, and months, seem to have passed in a blink of an eye. Some have learned new and great things. I surely learned a lot in my personal life and my career as a Potter in Manila, Philippines. It’s always good to leave behind, the things that stop us from growing in 2011. And be hopeful for greater things to come in 2012! I surely am hopeful for what is to come. Definitely excited to meet more students too! Plunge into newness in peace, happiness, and fulfillment. Three big words that can be experienced while making pottery. Know why people are going all the way to Quezon City and reserving slots for private pottery lessons. Experience the benefits of working with clay, as soon as you feel the earthy material between your hands. Bring life to a lump of clay. “I am not artistic!” or “I can’t do this!”, is not an excuse to learning something new anymore. Anything is possible, when you know that you are the one in control over your work. The Potter always controls the clay. Be one of the daring ones who wants to increase patience, focus, sensuality, and a creative, private time with yourself and your clay. 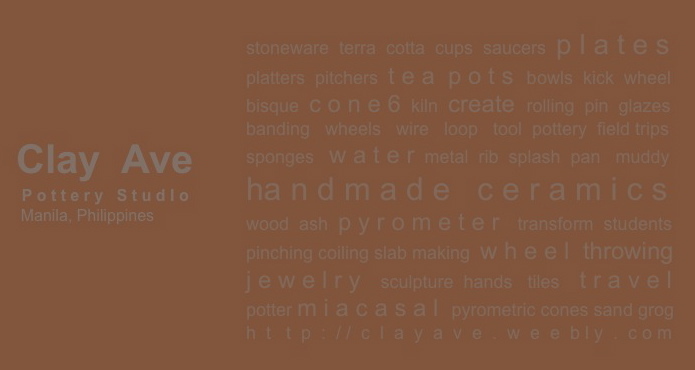 A lot of things are in store at Clay Ave Pottery Studio in 2012! More activities will be done in and out of Manila. Pottery field trips are back. And more people are getting their hands dirty with clay in and out of the city! A newsletter will be posted here each month for updates. “Like” Clay Ave Pottery Studio on Facebook to receive updates about lessons and other clay activities. Learn something new and be transformed as you make something functional with your own hands! No previous background in Ceramics is needed to learn a traditional craft. All you need is the willingness to get your hands dirty with clay! Are you ready to take the muddy plunge? Reserve a slot now. Slots are getting filled up really fast! To see the schedule for January 2012, please visit http://clayave.weebly.com/schedule.html. Send an e-mail to clay.ave@gmail.com to reserve a slot. Happy Holidays Clay Ave Students! 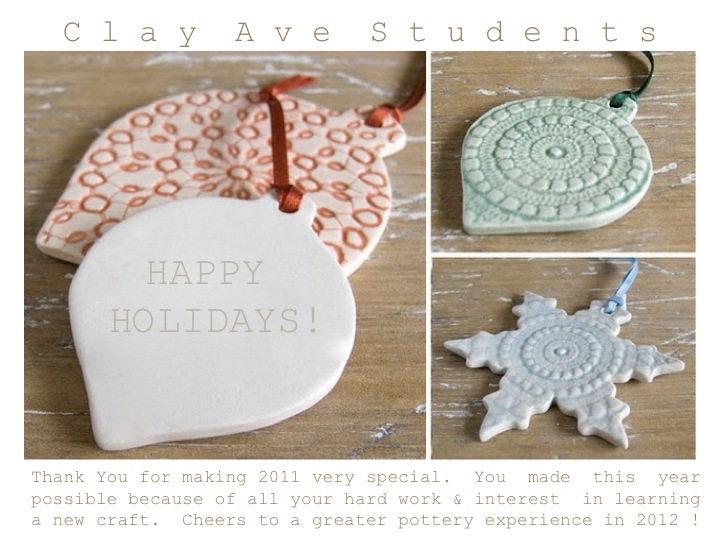 I would like to thank all the students who have enrolled at Clay Ave Pottery Studio since January 2011. It was just a dream to teach pottery again and you made it all possible! Clay is being processed and the kiln has been fiery because of all your hard work. Thank You for your curiosity in learning a new craft, and your dedication in finishing the first set of six sessions. I appreciate our exchange of funny and inspiring stories. I wish you all the best in the coming year. May greater blessings come your way in 2012. You are all welcome to come and get all muddy again! More potter’s wheels will be added to the pottery studio in February. So to those who are finished, with The Basics of Hand Building Pottery, it’s time to kick the wheel! Clay Ave is definitely growing. Thanks to old and new students! A Pottery field trip is happening in January! To those who didn’t make it to the first one, we are going back to Ugu Bigyan’s pottery haven in Tiaong, Quezon. Experience great food in a tropical setting, see the artist do a pottery demo, and tour the pottery workshop too! Three hours south of Manila and an unlimited feast on ceramics in one day! More activities are in store in the new year. ‎”Like” Clay Ave Pottery Studio on Facebook and get updates about schedule for 2012 classes, recent lesson photos, pottery field trips, clay travels, etc. Happy Holidays from the mud pit in Quezon City!